I think she (the author) has a good concept for a story here. 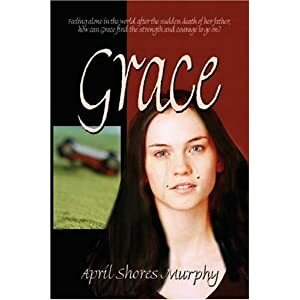 Grace’s father has been killed by a drunk driver and the novel begins after the funeral, as the family struggles to reconcile their faith with the anguish of reality. The back cover begins, “How do you learn to forgive and go on with life?” However, throughout the entire book, Grace does not once seem bitter or angry. She’s realistically sad and thoughtful, reminded many times each day of the important missing person, but not struggling with forgiveness. Shores begins the story without explaining the cause of the father’s death, and does well in giving that information gradually; however, that’s the only thing that isn’t spelled out in minute detail. Every single thought and motivation are laid out so that the reader does not have to use her mind. Perhaps it is intended for the younger reader. As for the editing, the grammar is atrocious. I was looking for a red pen while reading. (The teacher emerges!) I was bombarded by exclamation marks. Every paragraph has at least one. I finally counted them and found a minimum of seven on a page, and nineteen on another! Oh, sorry, the first page has none; after that there are some on every page! The book is littered with incorrect grammar (“…and her and Brandy began their homework”), changes in tense, misplaced punctuation, and there are a lot of incomplete sentences; too many to attiribute to “poetic license.” This book has a lot of potential but the many small editorial mistakes are distracting and detract from the overall presentation. PublishAmerica needs to provide much better editing support to their authors as they are responsible for presenting a polished (or unpolished) novel. I must say that this seems to be a problem with many of PublishAmerica’s novels. I believe this novel has potential. Although the main characters, the Hollingsworth family, are a little too perfect, (teenagers do NOT get along with their six-year-old sisters one hundred percent of the time) and they have absolutely no flaws, real life situations are dealt with, and the characters have to learn to rely on God. Yes, with proper editing, this could be a good novel. With proper editing, I would be likely to recommend Grace to readers.